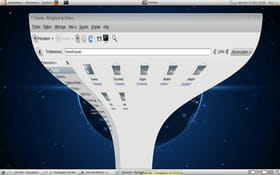 Compiz is a compositing window manager for Windows which uses a 3D graphics hardware for window management by creating rapid compositing desktop effects. These effects, like cube workspace and minimization effect, are implemented as loadable plug-ins. Compiz uses small programs called decorators to draw window borders with maximize, minimize and close buttons. The reduction of windows in MAC is very fluid. You can have the same effect under Linux with Compiz. Compiz brings a variety of visual effects which make Linux desktop more powerful, easy to use, intuitive and more accessible for users with specific requirements. Above all, we must temporarily disable Compiz: right click on desktop> Change the background> tab "Visual Effects"> check the box "No". Press"Enter" and type your password. The software installs. Make a backup of the files you will change. Tweaking the system files is tricky, but here it will be very easy. Above all, follow these tips and it will work. Go to Edit> Find then in the window in the right box, type (do not pay attention to the point that appears when you click): magic_lamp_max_waves and do "Find Next". Normally, there is something (that is highlighted in red). Just below it you should see <min>3</min . Then replace the "3" with a "0" (zero, not the letter o). Once done, save: File> Save. Then do the same thing: search for "magic_lamp_max_waves" and replacing 3 by a 0 and save. The text editor opens. Make Search> Search and set the same thing: magic_lamp_max_waves. You should see below a list of languages. Go down (just the list under magic_lamp_max_waves). Replace < min >3< /min > by < min >0< /min > and save. All that is left is to activate the option in Compiz. Re-activate Compiz (right click on desktop> change the desktop background> tab "Visual Effects"> check "Total". Then open the configuration editor: Compiz Config (System> Preferences> Configuration Manager CompizConfig). Click on "Animation". Under the "Animation at the cut," put "Magic Lamp" and a duration of 400ms. Then go into the last tab (Setup tab effect ) for this purpose. Find the line "Magic Lamp" and put the cursor "Number of waves up to the Magic Lamp" to 0. Now you can set it to 0. Gotbletu for his video on YouTube. Published by jak58. Latest update on November 8, 2012 at 04:36 PM by Jean-François Pillou. This document, titled "Compiz - Minimize a window like OS-X ," is available under the Creative Commons license. Any copy, reuse, or modification of the content should be sufficiently credited to CCM (https://ccm.net/). Linux - No graphic mode?